UNITED NATIONS, Mar 3 2017 (IPS) - Yayi Bayam Diouf became the first woman to fish in her small rural fishing village in Senegal despite initially being told by the men in her community that the fish wouldn’t take bait from a menstruating woman. When she started practicing law, Ann Green, CEO of ANZ Lao, was asked to make coffee or pick up dry cleaning (by men and women), simply because she was a young woman. The difficulties faced by Yayi and Ann in entering the labour force and at the workplace are not only unique to them, but sadly is the reality for many women across the globe. These difficulties represent violations of women’s human rights to work and their rights at work with gender-discriminatory laws still in existence in 155 countries, resulting in the gender wage gap of 23 percent globally. Also, women represent 75 percent of informal employment, in low-paid and undervalued jobs that are usually unprotected by labour laws, and lack social protection. Only half of women participate in the labour force compared to three quarters of men, and in most developing countries it is as low as 25 percent. Women spend 2.5 times more time and effort than men on unpaid care work and household responsibilities. All of this results in women taking home 1/10 of the global income, while accounting for 2/3 of global working hours. These inequalities have devastating immediate and long-terms negative impacts on women who have a lower lifetime income, have saved less, and yet face higher overall retirement and healthcare costs due to a longer life expectancy. Women’s economic empowerment is about transforming the world of work, which is still very patriarchal and treats the equal voice, participation and leadership of women as an anomaly, tokenism, compartment or add on. Despite recognizing progress, structural barriers continue to hinder progress towards women’s economic empowerment globally. Women in all professions face what we call sticky floors, leaking pipelines and broken ladders, glass ceilings and glass walls! At the current pace, it may take 170 years to achieve economic equality among men and women – according to estimates from the World Economic Forum’s latest Gender Gap Report. This is simply unacceptable. To accelerate the move to a planet 50/50 in women’s economic empowerment and work will require a transformation of both the public and private sector environments and world of work they create for women and also how they change it to make it a women’s space of productive and fulfilling work. It will mean adopting necessary laws, policies and special measures by governments. It means their actively regulating and providing incentives to companies and enterprises to become gender equal employers, supply chains and incubators of innovation and entrepreneurship. The 2030 Agenda for Sustainable Development, together with the Addis Ababa Action Agenda (on financing for development), position gender equality and the empowerment of women as critical and essential drivers for sustainable development. There is a Sustainable Development Goal on gender equality (Goal 5) which seeks to ‘Achieve gender equality and empower all women and girls’ and sets out global targets to address many of the remaining obstacles to gender inequality. 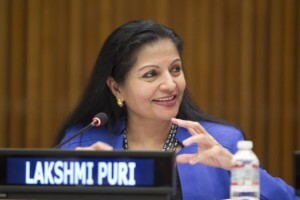 The framework recognizes women’s economic empowerment as essential enabler and beneficiary of gender equality and sustainable development and a means of implementation of all the six targets of SDG 5, including ending all forms of discrimination against all women and girls; ending all forms of violence and harmful practices like child marriage: recognizing and valuing unpaid care and domestic work through the provision of public services, infrastructure and social protection policies and the promotion of shared responsibility within the household and the family; ensuring women’s full and effective participation and equal opportunities for leadership at all levels of decision-making in political, economic and public life; and ensuring universal access to sexual and reproductive health and rights. Achieving these targets would have a multiplier effect across all other development areas, including ensuring equal access to decent work and full and productive employment (SDG 8), ending poverty (SDG-1), food security (SDG-2), universal health (SDG-3), quality education (SDG-4) and reducing inequalities (SDG-10). The upcoming 61st session of the Commission on the Status of Women (CSW61) will consider “Women’s Economic Empowerment in The Changing World of Work”, as its priority theme providing the international community the opportunity to define concrete, practical and action-oriented recommendations to overcome the structural barriers to gender equality, gender-based discrimination and violence against women at work. We live in a world where change is happening constantly, presenting new challenges and opportunities to the realization of women’s economic empowerment. The innovations – especially in digital and information and communications technologies, mobility and informality are also increasing rapidly. Emerging areas, such as the green economy and climate change mitigation and adaptation offer new opportunities for decent work for women. Also, in the context of new digital and information technologies, it is estimated that women will lose five jobs for every job gained compared with men losing three jobs for every job gained in the fourth industrial revolution. Successful harnessing of technological innovations is an imperative as is women’s STEM education and capability building, financial and digital inclusion for the realization of women’s economic empowerment. Achievement of women’s economic empowerment, as well its related benefits, requires transformative and structural change. In his report on the priority theme of CSW61, the Secretary-General of the United Nations identifies are four concrete action areas in achieving women’s economic empowerment in the changing world of work, including strengthening normative and legal frameworks for full employment and decent work for all women at all levels; implementing economic and social policies for women’s economic empowerment; addressing the growing informality of work and mobility of women workers and technology driven changes; and strengthening private sector role in women’s economic empowerment. Progress must be provided from both the demand and supply sides of the labour market. From the demand side, the enhancement of capacity building and the creation of a value chain of education skills and training for women is key to accelerating change. This will in turn lead to decent work opportunities as well as productive employment for women. From the supply side, there must be a creation of an enabling environment for women to be recruited, retained and promoted in the work place, including through promoting policies to manage trade and financial globalization. These forces, profoundly altering the world of work should come as a benefit to women and the working poor in rural and urban areas; and macroeconomic and labour market policies must create decent jobs, protect worker rights, and generate living wages, including for informal and migrant women workers. Enhanced interventions to tackle persistent gender inequalities and gaps in the world of work, and stepped-up attention to technological and digital changes to ensure they become vehicles for women’s economic empowerment are needed. The creation of quality paid care economy is also pivotal in employment creation and in empowering at least a billion women- directly and indirectly as well as providing much needed jobs for all! Transformative change is not only possible but it would generate tremendous dividends for the economy. According to the McKinsey Global Institute, if women were to play an identical role in labour markets to that of men, as much as USD 28 trillion, or 26 percent, could be added to global annual GDP by 2025. Moreover, the total value of unpaid care and domestic work, dominated by women, is estimated to be between 10 and 39 per cent of national GDPs, and can surpass that of manufacturing, commerce, transportation and other key sectors. With women’s economic empowerment the global economy can therefore yield inclusive growth that generates decent work for all and reduces poverty ensuring that no one is left behind. With the United Nations Observance of International Women’s Day, we celebrate the tectonic shift in the way that gender equality and women’s economic empowerment has been prioritized and valued in the international development agenda and express the resolve that we will all do everything it takes including transformative financing to achieve the ambitious goal of Planet 50/50 in the world of work by 2030.